The Central Bank of Turkey (CBT) held its one-week repo auction rate at 24 pct on January 16thas widely expected, saying risks on price stability continue to prevail although there was some improvement in the inflation outlook. CBT left all monetary policy parameters unchanged at yesterday's MPC meeting and reiterated that a tight stance would be maintained until inflation had improved significantly, this was in line with our expectations. The country's annual inflation rate fell to a four-month low of 20.3 pct in December, still way above the central bank's midpoint target of 5 pct. Nevertheless, CBT's general tone turned out to be somewhat more hawkish than we had anticipated, which triggered a sharp lira rally after the market had a chance to digest the statement. Among the statements was a reiteration that additional monetary tightening would be delivered if required. There was no attempt to hype up the inflation moderation which has occurred thus far as an argument to start contemplating lower interest rates. The base-case had been that CBT would highlight that economic growth had collapsed, and that a stable lira had begun to bring down inflation and that if these trends were to progress further, there would be a case for measured rate cuts in the months ahead. It was not expected that CBT to cut rates already, but this is mainly because the lira has shown signs of fragility in recent weeks. But, we expected CBT's language to move in a dovish direction indeed, there were forecasters predicting a rate cut already yesterday based on similar expectations but, this did not happen. 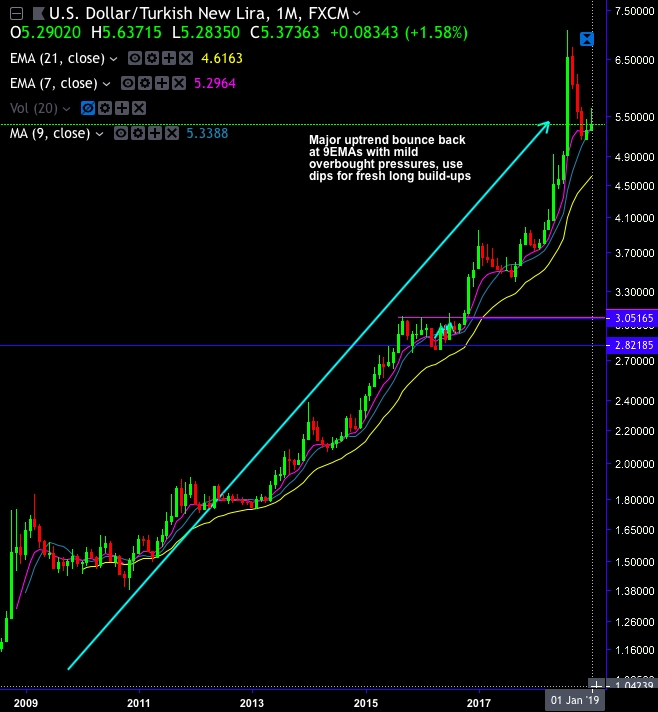 CBT's stance proved more hawkish, and this spurred the lira on. Going forward, if January data were to bring softer inflation data, this would work in the lira's favor. We, however, prefer to keep a cautious view of the medium-term inflation outlook. Trade tips: We advocated 3m USDTRY debit call spreads a week ago (3m 5.25/6.77 call spreads at net debit) with a view to arresting upside risks when Turkish Finance Minister Berat Albayrak announced a cheap lending scheme for SME's, by then spot reference was at 5.5410 levels. The underlying spot has now slid a bit (refer above price chart) but reamins well above ITM strikes, which means our short legs are performing desirably. We now like to uphold the same strategy, thereby, one achieves hedging objective as the deep in the money call option with a very strong delta will move in tandem with the underlying spikes. The rationale for the trading: Please observe that the above technical chart is also clearly indicating the further upside risks. It seems that hedgers of TRY are also in line with the above fundamental factors. As you could observe the above nutshell, IV skews of USDTRY is also indicating the upside risks as the hedgers’ interests for OTM call remain intact (refer above nutshell). Currency Strength Index: FxWirePro's hourly USD spot index is flashing 84 (which is bullish), at press time 14:13 GMT).